The group named To Make! and led by RecchiEngineering work alongside Turin City Council to develop the new masterplan called Variante 200 and the definition of financial and economic Analysis. After several weeks of analysis, the jury appointed by the City Council chose the winning bid, for the new masterplan which involves an area of more than one million square metres of disused industrial and railway areas which are a mixture of public and private property. 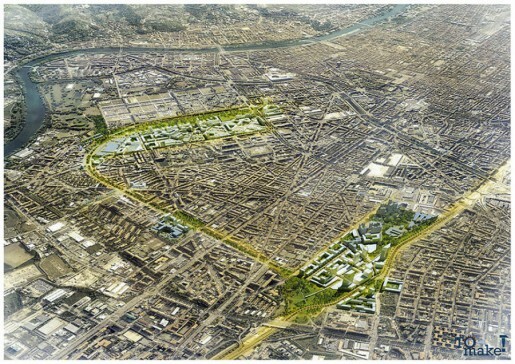 It represents the most strategic urban development plan for the City of Turin over the next twenty years. Sixteen tenders were submitted by teams from Italy and abroad. A concrete project, developed by an international team which has managed to combine the multiple design themes, through a multidisciplinary and innovative approach in order to develop a new way of creating a city. Innovation, flexibility, sustainability and incremental development are the key factors of the project. The Variante 200 has been started considering directly territory and market, in order to design an urban development model that couldn’t be excluded from its economic feasibility, with desire to create a tool which is not utopian but really feasible. The leader of the team that will work to develop Variante 200 is RecchiEngineering, composed of professionals with international experience in urban projects. Recchiengineering will be flanked by Architekten Cie Architects , Avalon, which will provide financial advice, the master planner-architect Matteo Robiglio from Tra (formerly with Avventura Urbana), based in Turin and with years of experience in the field of participatory design, Mesa for market analysis, Manens-Tifs for environmental aspects of the project, Nctm for legal advice and the real estate development firm Hines responsible for International Marketing.